Setting strategic direction is like setting a course for success or failure. After the right course is set, the critical work begins. There are varying levels of planning required to support the operationalization of the strategy. 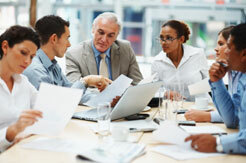 Planning takes on different characteristics in various stages of the planning process. The stages range from purely strategic to operational action plans. 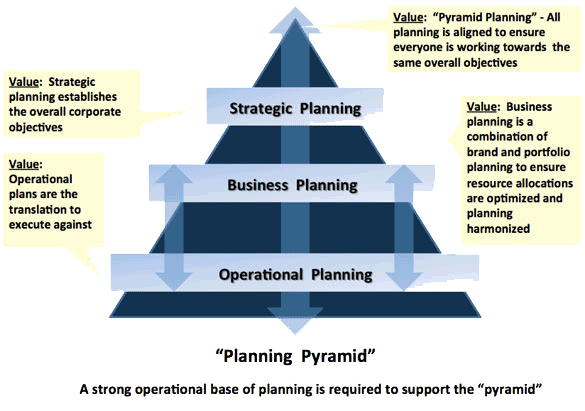 An important point to realize in the “pyramid” of planning is that a well aligned strategic plan needs astutely designed and executed operational plans to sustain the “pyramid”. Your team and Altometrixs can work together to determine the optimal place in the strategy pyramid where you need the most impactful assistance. A “sweet spot” for realizing the opportunity is in the Operational Planning, a focus for Altometrixs. Planning can occur at multiples levels in the organization. The planning scenarios and are outlined below to better understand what services/ activities are provided under the umbrella of strategic and operations management. Situation Multiple planning processes with different timelines and information needs from multiple stakeholders can result in less than optimal resource allocation decision making. Obstacles Differing stakeholder objectives can drive an inefficient process that is optimized individually but sub-optimized to meet overall corporate planning needs. Align timing needs and define core common planning elements across multiple stakeholders through timeline alignment. Develop a process that meets the lowest level of common planning needs and sets expectations across the organization for required input and timing. Results in a consistent process that is more efficient and effective. Senior management decision making process is supported by information that can be aggregated and accessed consistently across the portfolio. Situation Brand strategies not translated effectively into the managed markets, account management and field sales strategies to support achievement of brand objectives. Obstacles Differing stakeholder objectives can drive an inefficient process that is optimized to meet brand needs but sub-optimizes the needs of the supporting functions. The brand strategic planning processes is moved from strategy to being operationalized and then executed upon. Situation Drug and distribution channels are not always leveraged to increase that patient care or revenue potential. Situation The execution phase of many strategies is lost in the strategic translation. Operational planning focuses on the translation to ensure the “right” focus is on the “right” priorities. Obstacles Sales and marketing organizations have a tendency to think anything is possible all the time. Realistic planning within operational constraints establishes realistic expectations. The above set of example give you a rough idea of the type of situations where Altometrixs may be able to assist you. With each individual client, our team applies its time-tested methodologies to quickly, cost-effectively and comprehensively upgrade your team and processes towards a high-performing, industry-leading operation. We encourage you to schedule a complimentary consultation with Altometrixs — to explore possible outcomes and financial improvements that can successfully drive your business.